Over the last few months, I've been thinking a lot about my plans for the next couple of years and in particular moving out. I've been dreaming about what I'd like my first home to look like when I've finished decorating it and I've been on Pinterest a lot recently being inspired. I've been so inspired that I decided to create a mood board for how I think I'd like my living room to look. So if you want to find out more about what's on my living room wishlist and what I envision it might look like, click on to read more. For me the sofa is the main feature of a living room and what you'd probably base the rest of your room around. For John and I, we've already discussed the idea of getting a beautiful corner sofa and in fabric - because we both don't like leather all that much. And I know we're both big fans of grey so a grey sofa would be beautiful. This fabric corner sofa from Fishpools is what I'd be looking for when we've bought our first home. 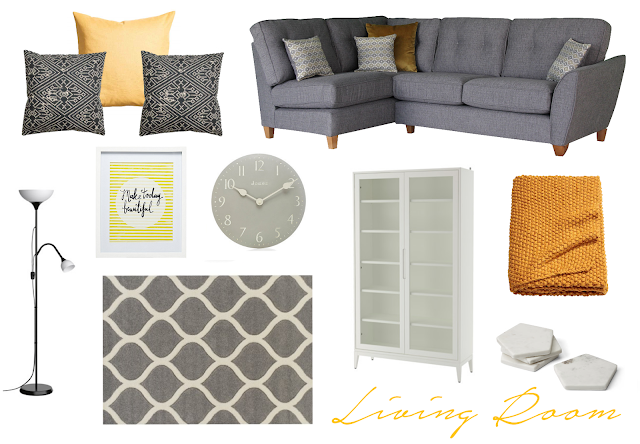 When I think of my future living room, my colour scheme is monochrome with an accent colour and right now I'm a big fan of yellow so I'd love yellow cushions, a throw and wall art to really make it feel homely. What's great about an accent colour is that it can always be changed especially in a monochrome room because everything goes with monochrome! Other things that I love on this wishlist is the floor lamp which would be amazing for late night reading and adding a homely ambience and the glass-door cabinet which is my dream cabinet to display sentimental things like ornaments and photographs as well as storing things like books and some pretty storage boxes. The more I think about it the more I can imagine my future home coming to life and it really excites me because that time is actually just around the corner! My future living room is truly the only room I can imagine right now and probably because I've imagined what it might be like walking in from work every day and what my favourite room in the house might look like and it's always monochrome with a pop of colour. It's really exciting and I can't wait for the time to come to decorate my first living room with John. If you liked this post, please let me know because I'd love to create some more style posts of how I'd imagine other rooms in my future home to look like. What do you imagine your dream living room or first home living room looks like? I really love this! It makes me so excited for my own house. It will inspire me to make my home something like that.